The third week in July is officially recognized as Zookeeper Week, a week where we are encouraged to recognize and be thankful for the hard work that zookeepers put in every day at their jobs. 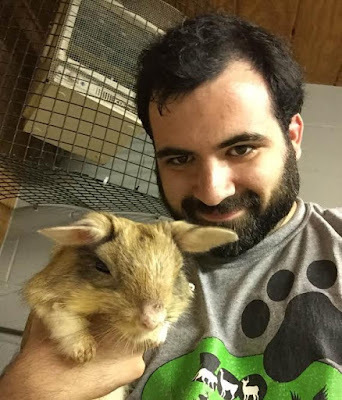 As you may or may not know, I have been a zookeeper for two amazing facilities. The experiences I gained from that line of work, with regards to working with the animals and my coworkers, is priceless and continues to stick with me every day as I go on with my life. One of these facilities I started working at when I was only thirteen years old, so exotic animals has been a part of my life for a long time. All this being said, if you like wildlife, it is important that you go out and support zoos every chance you can. This photo was taken on my last day at the Bergen County Zoo earlier this summer. The animal I am holding is called a Springhaas or Springhare. It is a rodent native to Africa that hops on its hind legs like a small kangaroo. It's one of those animals that few people have heard of and it's a real shame because they really are awesome. The amount of work that zookeepers put into their jobs is insane. If you were to go online and look up job openings for zookeepers, you will notice that they all require you to have at least a bachelor's degree in biology, zoology, ecology, or something else related. (Many prefer you have even more academia under your belt.) Often times in order to get a paying zoo job, you need to start as an intern or volunteer first. For some reason there is a silly idea that some people believe that a zookeeper is a position you have if you don't do well in life. I actually overheard a father say to his kids as they watched a keeper clean an enclosure "See kids? That's what happens when you don't go to college!" Little did he know that keeper probably has more education (and very likely could have been happier with her job) than him. I made this a few years ago. There is actually a bit more to the job than picking up poop...but poop is a big part of it. You then would notice that the hours are pretty crazy. Zookeepers need to be at the zoo hours before opening to feed and clean enclosures and hours after closing for the same reasons. Animals need to be taken care of every day...even Christmas...and New Years...and Thanksgiving...and if the weather is bad and there is six feet of snow outside...or if the streets are covered in ice... or flooded from a hurricane. (All things I have personally worked through, by the way! I knew it was bad when I had to stop my car and move wooden road blocks out of the way to get to work one morning.) There is a team of keepers at the zoo every single day. When I was working, many times visitors would ask me when we close for the season, to which I reply "We are open year round." They look surprised at me especially when I confirm that we are even open on holidays. Animals are alive, people! They need to eat just like you! 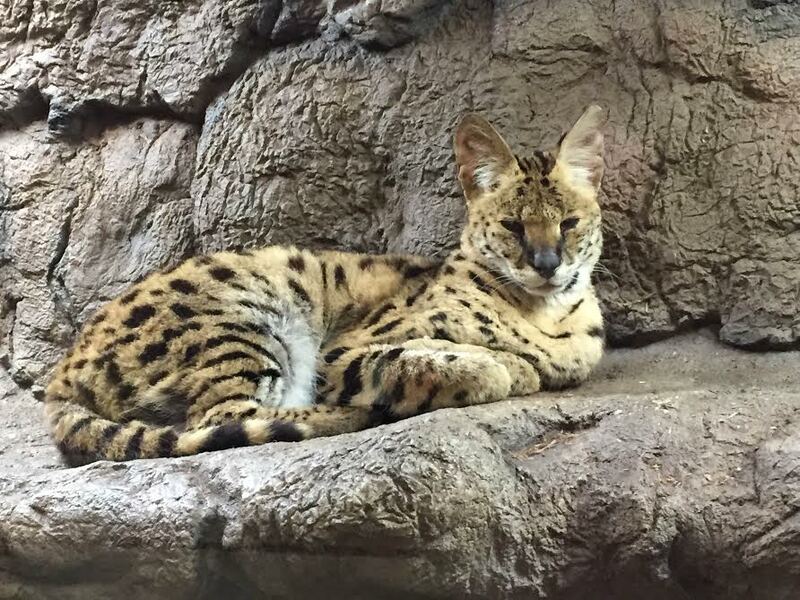 Tigger here is a Serval, a cat native to the savannahs Africa. He was originally obtained (I have no clue how) as a kitten by a man who intended to keep him in his apartment until (shocker) he got too big! He now lives safely and happily with us at a facility that can meet the needs. Many animals you see in zoos, have similar stories. Zoos, in addition to promoting education and conservation, are also sanctuaries for exotic animals that have been rescued from places they should never have been at in the first place. You might be thinking, "Wow! No wonder it's so competitive! Zookeepers must have it made!" Then scroll down and check out the pay. Most zookeepers make about minimum wage. Many work second jobs. So why do we do it? Why is it so competitive? 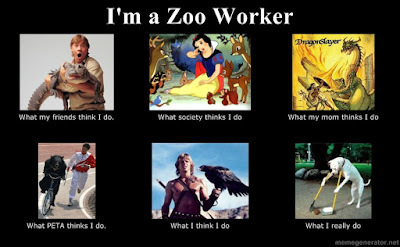 The answer to that is that all zookeepers genuinely care about the animals they work with and love what they do. Every single one. Another nasty, false image, which is very common in the minds of people who think zoos are prisons/bad for animals (which I can go into debunking another time) is that of a zookeeper who simply goes through the motions every day and works towards the paycheck at the end of the week. I will go on record in saying that in my experience, I have never met one zookeeper who fit that description. We do what we do for the animals, not the money. I have been very fortunate to have only ever worked at places I genuinely loved. Like I said, I started in a zoo when I was only thirteen, and only when forward from there. The way that I can tell I have the right job is when I'm having a bad day, the kind of day when I'm tired and frankly just want to nap/cry, I ask myself in the middle of all that "Is there anyplace else you would rather be right now?" If the honest answer is "no" then I know I'm in the right place. I challenge you to do it the next time you are having a bad day at work! Burmese Python cuddle parties are the best parties. It can put anyone in a good mood. So you get that zookeepers work hard, but what do they do they do that benefits everyone else? Well for starters they allow us to see animals in person that otherwise most of us would only ever see in books or on television. Think about it, unless you shelled out the money for a special access trip to the jungles of Africa (I know I sure can't afford it), how would you ever see a live Gorilla, let alone up close and safely? Not only do zookeepers make the animals accessible to you, but they make sure that the animals are entertained too. It's mindblowing how much research and work goes into keeping the animals healthy, comfortable, and happy at zoos. Since the animals in zoos don't have to stress over hunting/foraging or finding shelter, we need to make sure their extra time is stimulating in other ways. Depending on the species, we do this by giving them different toys to play with, introducing smells into their enclosure for them to react to, like safe perfumes, spices, or even fur or feathers from a neighboring zoo tenant! (Our porcupine and mountain lions love to chew on the Elk's shed antlers!) We also will feed them in ways other than just plopping the food down in front of their faces so they still need to work or use their brains to get meals. For example, around Christmas time, we feed some of the animals by putting their food in a wrapped cardboard box (we have to meticulously check each one for staples and tape first to make sure they are all safe first, of course.) The results are stimulating for the animals and fun to watch. Below are videos I shot of our Mountain Lions and Male Andean Condor engaging in the holiday fun. Zookeepers also do good for wild animals. 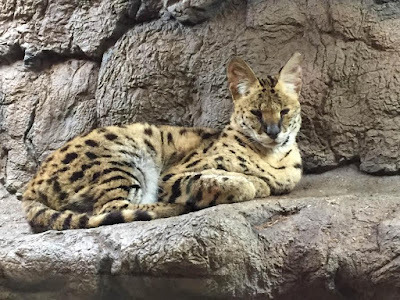 When you visit an AZA accredited (Association of Zoos and Aquariums) zoo and pay admission, part of the money you spend goes towards wildlife conservation and research. In fact, each AZA zoo is required to do this in order to keep its license as an AZA facility. The zoo I worked at, for instance, funds research of wild giant armadillos in South America, a mammal that we still don't really know all that much about in the wild! 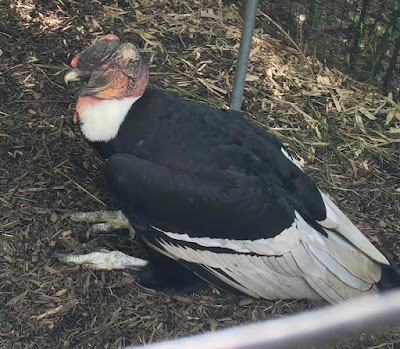 We were also were able to release an Andean Condor we bred into the wild with a number and tracker. When she was last seen over the Andes Mountains, flying with a male partner, and may have produced chicks of her own. How exciting! As you can see now, there is more to being a zookeeper than just shoveling poop and picking up a paycheck. (Okay, actually there is a lot of poop shoveling.) We do what we do because the experience is priceless to us. So go out and visit your nearest zoo! Learn new things. Ask questions! Happy Zookeeper Appreciation Week! Go out and hug a zookeeper...unless they don't want to be touched...some of them don't like to be touched by strangers...also they might have tapir poop on them or something...not like there is anything wrong with that!...Maybe just say thank you. For more information on Zookeeper Week click here!